Most people who have been in IT for a while will know the Windows Sysinternals tools and most certainly the small but brilliant Disk2VHD tool we can use for Physical To Virtual (P2V) and Virtual to Virtual (V2V) conversions. It’s free, it’s good and it’s trustworthy as it’s made available by Microsoft. For legacy systems, whether they are physical with IDE/SATA/SAS controllers or virtual with an IDE generation 1 VMS thing normally go smooth. But sometimes you have hiccups. One of those is when you do a V2V of a generation 2 virtual machine using Disk2VHD. It’s a small issue, when you create a new generation 2 VM and point it to the OS vhdx it just won’t boot. That’s pretty annoying. Why do a V2V in such a case you might ask. Well, sometimes is the only or fasted way to get out of pickle with a ton of phantom, non-removable checkpoints you’ve gotten yourself into. But back to the real subject, how to fix this. What we need to do is repair the boot partition. Well recreate it actually as when you look at it after the conversion you’ll notice is RAW. That’s no good. So let’s walk through how to fix a vdhx that your created from a source generation 2 Hyper-V vm via Disk2VHD. First of all create a new generation 2 VM that we’ll use with our new VHDX we created using Disk2VHD. Don’t create a new vdhx but select to use an existing one and point it to the one we just created with Disk2VHD. Rename it if needed to something more suitable. 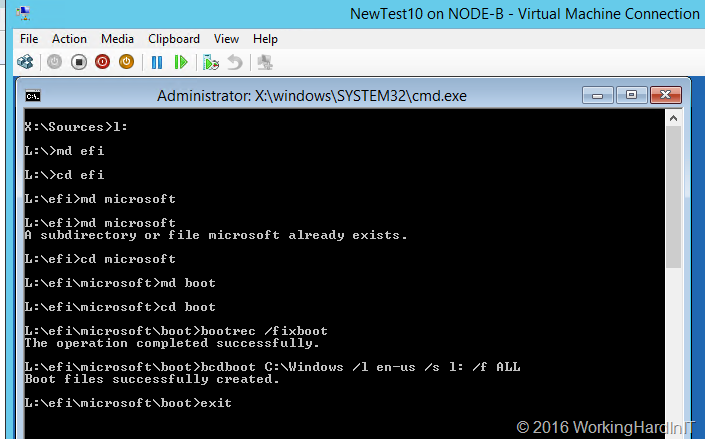 Don’t boot the VM but add a DVD and attach the Windows Server ISO of the version your vhdx contains to the DVD. Move the DVD to the top of the boot order I firmware. The VM will boot to the DVD when you hit a key. Type diskpart and list the disks. Select the disk we need (the OS disk, the only one here) and list the volumes. You can see that volume 3 off 99MB is RAW. That’s not supposed to be that way. So let’s fix this by creating boot loader directory structure, repair the boot record by creating the boot sector & copy the needed boot files into it. That’s it we can now us that 99MB volume to make our disk bootable to windows again. Type Exit to leave diskpart. .. and voila, your new VM has now booted. Now it’s a matter of cleaning up the remnants of the original VMs hardware such as the NIC and maybe some other devices. The NIC is very important as it will have any static TCP/IP configuration you might want to assign tied to it which mean you can’t reuse it for your new VM. So, the 1st thing to do is uninstall the old network adapters from device managers, you’ll see them when you select “show hidden devices” in the view menu. This entry was posted in Hyper-V, IT Pro, Storage, Trouble Shooting, VHDX, Windows and tagged Boot Failes EFI SCSI Device, Disk2VHD, Generation 2 VM by workinghardinit. Bookmark the permalink. You, sir, deserve a medal. Fantastic article. Thanks so much for writing this up. Thank you, thank you, thank you. This article really helped me and I very much appreciate that you posted it here. Oh Yeah ! THank you so much ! Absolutely awesome – Thanks for saving me hours of stress! Glad it helped, I wrote it as I saw many people running into the issue. Thanks so much for helping me out of this bind! Your welcome. Good tip by they way. FYI: I’ve send a request to Microsoft to have this fixed in Disk2VHD, not sure if it’s a priority for them, but it has been asked. Many thanks. I used your instructions to get a windows 10 machine running that was not booting. The windows 10 disc and the same instructions worked. The only issue I had was that it would not work as Generation 1, but when I changed it to Generation 2 it booted. So thanks again, as aggravating as this was it was very helpful to have your help. You sir, is a genius. Thank you for sharing this document, which saved me A LOT of time! Happy it helped! Thx for reading. Absolutely awesome solution. Have tinkered and failed with this sort of conversion previously, but your guide is so succinct and easy to follow! Well done…..
Hi, this is an amazing article,,thank you very much. One question though, it worked on one VM i created but on a second one at the last stage where you execute the bcdboot i get the following message “Failure when attempting to copy boot files” this VM had 2 RAW volumes . I ran into this issue previously and it turned out that the volume was too small, so it probably failed to copy all necessary files. I picked a much larger volume and was able to proceed just fine. A tiny bit more space wasted but at least it worked. You can check to see if this applies to you. Interesting, I’ll have to verify that in the lab. Thx for sharing. I got the “Failure when attempting to copy boot files” error as well. It turned out that it was caused by the D: drive letter being assigned to the volume with Windows on it. I just needed to adjust the bcdboot command for that. Thank you! You helped me very much! BFSVC Warning: SerciceDebuggerFiles: C:\Windows\boot\BootDebuggerFiles.ini does not exit. Windows 7 32/64 bit is not supported on a generation 2 VM, the UEFI Boot module doesn’t support 32 bit and both 32/64 bit need a PIC that isn’t present in generation 2. So probably you boot issue had a different cause. This was extremely helpful for a Windows 10 disk2vhd UEFI laptop setup in a Hyper-V cluster. Thank you Sir! Happy to read it helped! made my day… thanks a lot. Was searching for hours, but this didi it. Windows 2012R2 Backup with DISK2VHD. Imported in 2012R2 Hyper-V, no boot. Many thanks for your article! Was desperated about this! Happy to read it helped you out José! Awesome post, this same process has enabled me to restore a VM using Shadow Protect HSR (Head Start Restore) to create Gen 2 VHDX from an operational VM. The Shadow Protect Recovery Environment could not fix the BCD error no matter what I tried. Happy to read it helped you. Thx for sharing and a happy new year! Thanks… This post save my life!!! Excellent article! This fixed my problem after I finished the steps. You are a lifesaver!! Excellent, thx so much this worked beautifully!!! The article attributes this problem to doing a V2V, but this happened to me when doing a P2V. It might just be a problem with using Disk2VHD with Windows Server 2012 R2. No I don’t think so. It has to do with EUFI (gen2 VMs are UEFI), not the OS version. Future versions might fix this. And similar issues can occur due to different reasons. You mileage may vary. Awesome !! This worked out straight away! Great work, thank heaps ! I had to come back and comment, I stumbled on the SOP regarding disk2vdh and though yah its another non working solution from the many I tried and from people claiming that they followed their solutions to the T and it worked. Man was I proven WRONG first try and I have the VM up and running that I struggled with the whole of last week. You my man deserves a medal. Thank You very Much!!!!!!! Thanks, glad you found it and it helped you! Need your help, once i reach to CMD to type the command the keyboard dont type. any solution for this? I think I love you! thank you so much! it works even with a WS2012 vhdx and W8 iso. Thanks for this! Worked perfectly after I used disk2vhd to P2V one of my Windows Server 2019. Happy it helped you out! Great article, thank-you for publishing. I have a Windows 10 Pro VHD file I created with disk2vhd. I have created a Virtual Box Machine with this disk file and have followed your instructions. I am unable to mark the BOOT partition as ACTIVE. When I boot I get a Fatal Error: INT 18 Boot Failure. I only cloned the C: drive, not the boot or recovery partitions. They exist in the VHD image, however they are listed as RAW disks. I have read that VirtualBox does not support EFI with Windows Guests, perhaps this is the problem. My host is MacOS. Any ideas how to get it booting again?